When Vetech Product Design & Development Ltd first opened its doors for business in 1994, the founders of the Buxton Company exploited their expertise in the garden equipment sector to win business from the globally recognised Bosch brand. Providing design, consultancy, subcontract manufacture and mould & die tooling, the Derbyshire business has retained Bosch as a core customer whilst branching into the military, general subcontract, electronic sensor and plastic moulding sectors. This diversification has been a welcome respite for a business that has noticed a dip in European business during the Brexit process. Not a business to rest on its laurels, Vetech has applied its expertise to the motorsport sector, converting the Suzuki Hayabusa motorcycle engine for use in the Mark I to VII Mini motorcar produced from 1959 to 2000. It is here the expertise of CAM developer OPEN MIND Technologies has come to the fore. The subcontract company has a plant list that includes manual and CNC machining centres, injection mould machines and test facilities. Part of the acquisition trail includes a Hurco VMX42M and a VMX30Ti machining centre with the larger VMX42M being retrofitted with a Hurco 4th axis rotary unit two years ago. 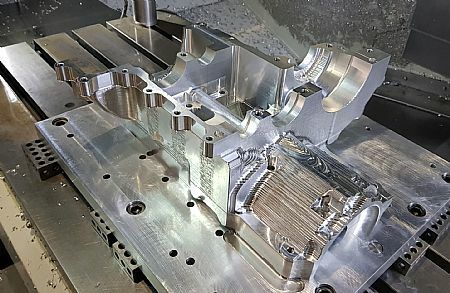 Designing and manufacturing complex aluminium mould tools, military sensors and the innovative Hayabusa engine, the previous CAD/CAM system was struggling to cope with component complexity. Being an extremely experienced CAD/CAM designer and programmer, Mr Smith has in-depth experience of all leading CAM packages, coincidentally being one of the first UK engineers to be trained on hyperMILL in the mid-1990’s during his previous employment at The Hyde Aerospace Group. 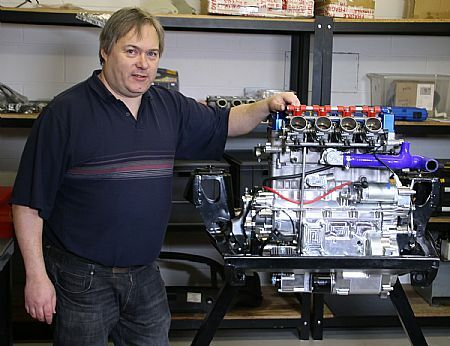 “Re-designing and re-manufacturing the Hayabusa 1300cc engine to fit into a Mini meant we had to re-position the gearbox and add a reverse gear. I gave the gear selector barrel to all the leading CAM vendors and asked them to program it. Re-engineering the Suzuki Hayabusa engine is undoubtedly an impressive feat of engineering that has genuine purpose. Once the power unit for the world’s fastest production road bike; the Hayabusa engine is a compact and powerful powertrain unit that can fit straight into the classic Mini whilst offering reliability despite the massive increase in performance. Such reliability is a rarity for any classic car. The repackaged engine has seen the Vetech engineers retain many of the power producing components of the original Hayabusa. However, the conversion has seen the Peak District Company add internal final drive gears and a differential, re-position the gearbox beneath the engine and crucially; add a fully integrated reverse gear. The engine has been turned back to front. The repackaged engine/transmission has ‘universal’ engine mounts; bespoke mountings have been designed and manufactured for the mini but the engine mounting bosses provided permit easy integration into other vehicles such as the Fiat 500 or Lotus Elise. What does all this mean for the Mini enthusiast? 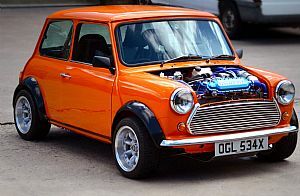 Even the most powerful production Mini variant ever only developed 96bhp, although the vast majority of minis only developed around 65bhp or less. An exceptionally highly tuned model can generate upwards of 120-130bhp, but with very low reliability as a consequence. The Hayabusa engine has a power output of 197bhp as standard and when re-packaged by Vetech, it weighs just 100kg. This is a 32% engine weight reduction over the original unit. For those with an inclination for seemingly jet-propelled speed, Vetech also offers a super-charged 300bhp unit. 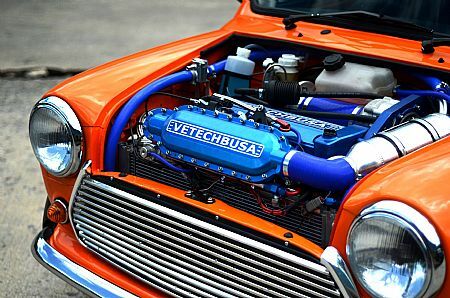 The Fastest Mini In The World...? During the development phase of the Vetech Hayabusa project, Vetech entered the 2016 ‘Fastest Mini in The World’ Race at Brands Hatch. Starting in last position on the grid, the power to weight ratio propelled the car to second position in just three laps, only failing to win the race due to a waterpump problem. “hyperMILL has slashed off-machine programming times as well as on-machine cycle times. It has also improved the quality, surface finish and consistency of our parts and mould tools. OPEN MIND has achieved all of this whilst giving us 100% confidence the machining strategies and toolpaths, something that is a credit to the exceptional anti-collision system in hyperMILL,” concludes Mr Smith.